The Grand Trunk Railway Company was incorporated in 1853 to construct the key railway of eastern Canada, intended to serve all the important cities in Ontario and Quebec, and to connect them with Chicago at its western end, and Portland, Maine, on the sea-coast, at its eastern end. It became the main railway system of Ontario and Quebec, absorbing rival companies and acquiring advantageous charters. 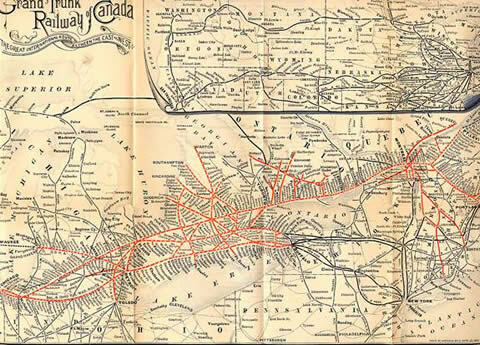 The main line between Montreal and Toronto was opened in October, 1856; and a line to Quebec had been opened in 1854. When first chartered in 1853 the Grand Trunk leased the lines of the Atlantic and St. Lawrence and the St. Lawrence and Atlantic Railways, from Portland;. to St. Hyacinthe, Quebec, and from St. Hyacinthe to Montreal, one condition of the lease being the construction by the Grand Trunk, of a bridge across the St. Lawrence at Montreal, which, as the Victoria Bridge, was opened in 1859. In November of the same year, the extension of the main line to Sarnia, via Guelph, Stratford, and London, was opened, competing with the Great Western Railway already operating in that district. Thus the Grand Trunk Railway provided through transportation from Sarnia to the sea-coast, a distance of 800 miles. In 1859 a line between Detroit and Port Huron was leased, and in 1860 an extension was opened from Quebec to Rivière du Loup, which was later sold to the Intercolonial Railway to provide funds for the line to Chicago. Financial difficulties then intervened, and further expansion was stopped for a few years. By 1867, however, the company had recovered financially, and in that year the Buffalo and Lake Huron Railway, from Fort Erie to Goderich, was leased. In 1880, operating under the name of the Grand Trunk Western Railway, the Grand Trunk opened a line between Port Huron and Chicago, thus completing the original scheme. In 1881, 171 miles of the Georgian Bay and Lake Erie group of railways was taken over, including the Northern Railway from Toronto to Collingwood via Barrie, and the Hamilton and Northwestern Railway. The one serious competitor was removed when amalgamation with the Great Western Railway, from Toronto to Hamilton and Windsor, and its branch lines, was achieved in 1882, adding 904 miles of road. Shortly afterwards, the Midland Railway of 473 miles, running between Port Hope and Midland, with a branch to Peterborough, was added. In 1891 the St. Clair tunnel at Sarnia was completed, giving an efficient connection with the United States; and further connections with the United States were acquired by taking over the Central Vermont Railway and by securing running rights over the Boston and Maine Railway, connecting with New York . Finally, in 1905, the Canada Atlantic, connecting the main line with Ottawa, was absorbed. By this date the Grand Trunk Railway system was practically complete. Up to 1902 the Grand Trunk had no means of tapping the growing traffic of the prairie provinces . It therefore began, under the energetic direction of C. M. Hays, to dream of a western extension. The Dominion government tried to bring together the Grand Trunk, seeking western traffic, and the Canadian Northern, seeking a through road to the eastern sea coast. Negotiations failed, and the Grand Trunk agreed to a scheme for a new national transcontinental. The eastern division from Moncton to Winnipeg through northern Quebec and Ontario, known as the National Transcontinental, was to be built by the Dominion government; the western division from Winnipeg to Prince Rupert was to be built by the Grand Trunk Pacific Railway Company, a subsidiary of the Grand Trunk. The results of this venture were disastrous. The Grand Trunk Pacific had to be relieved of its obligation to operate the National Transcontinental when it was completed in 1915, and after having been kept alive for some years by government assistance the directors of the Grand Trunk Pacific informed the government in 1919 that they could not operate any longer, and the railway passed into the hands of the minister of Railways as receiver. Largely as a result of this unsuccessful venture, the Grand Trunk Railway, which had in­curred liabilities amounting. to $123,­280,980 in connection with the Grand Trunk Pacific, was involved in difficulty and was also taken over by the Dominion government. The negotiations were protracted, and it was not until January 30, 1923, that this system, with an operating mileage of 4,776 miles, became a part of the Canadian National Railways. The Grand Trunk Railway was built before the days of government subsidies and guarantees. It was privately owned; practically all the capital came from private investors in England; and the head office and board of directors were in London . When the railway was first proposed, a Canadian company was formed, headed by the president of the St. Lawrence and Atlantic Railway, but difficulties were met with in securing capital, and finally the charter was awarded to an English company of contractors, aided politically by Francis Hincks, inspector-general in Canada. In its early years the credit of the company was not sufficiently established to permit easy marketing of securities, and the sum resulting from their sale was far less than the capital liability created by their issuance. Be­tween 1850 and 1860, owing to monetary conditions and competition in railway building, the cost of construction and the wages were much higher than anticipated; and owing to the com­petition between its main line and a parallel waterway in the St. Lawrence river system and the Great lakes, the volume of traffic failed to come-up to expectations. Government aid was therefore urgently required. During this period a total of over $15,000,000 was lent by the government. In 1861 the company was unable to pay the interest on its bonds, and the government withdrew its interest claims on loans until the earnings of the company were sufficient to pay dividends on its common stock. No interest payment was ever made on these loans, for the holders of common stock never received any dividends. Further capital was acquired by the issuance and sale of second preference bonds, in England . Following the report of the Commission of Railway Inquiry, negotiations were commenced by the government with a view to the acquisition of the Grand Trunk and its subsidiaries. In 1919 the Grand Trunk Pacific was allowed to go into receivership, thus relieving the parent company of its responsibilities. The Grand Trunk itself was in a less critical condition, and was able to bargain. Agreement was finally reached, and on October 10, 1919 , a bill for the acquisition of the Grand Trunk Railway was brought into the House. The terms of the agreement were as follows: (1) The government was to guarantee payment of dividends on 4 per cent guaranteed. stock, equalling $12,500,000, the stock to be left in the hands of private holders. (2) The value, if any, of the three preference stocks and the common stock was to be left to be determined by a board of three arbitrators. When the value was determined they were to be transferred to the government and in their place "new guaranteed stock" at 4 per cent. was to be issued to the holders in such proportions as the arbitrators should determine; these' might be called in by the government after 30 years. (3) Debenture stock, the equivalent of bonds, was to be continued, and interest guaranteed by the government. (4) All voting power should be taken from the stock holders. (5) A committee of management was to operate the railway with the Canadian National Railways until the handing over of the preference and common stocks, when the railway should then come under the same management as the Canadian National Railways. The majority report of the board of arbitrators appointed to determine the value of the preference and common stocks held that the stock in question was of no value. Naturally, the holders of this stock were considerably incensed over this decision, and for several years there was much litigation. The government, however, has remained firm. For a fuller treatment of the history of the railway, see T. S. Brown, A history of the Grand Trunk Railway of Canada, compiled from public documents (Quebec, 1864), W. McNab, Historical narrative of the inception and development of the Grand Trunk Railway Company of Canada (Montreal, 1923), H. A. Lovett, Canada and the Grand Trunk (Montreal, 1924), D. B. Hanna, Trains of recollection (Toronto, 1924), and for the Grand Trunk Pacific Railway, F. A. Talbot, The making of a great Canadian railway (London, 1912). Source : V. W. BLADEN, "Grand Trunk Railway", in W. Stewart WALLACE, ed., The Encyclopedia of Canada , Vol. III, Toronto, University Associates of Canada, 1948, 396p., pp. 68-71.